Real Conversations With Melody Fox 11/29/14 Was Epic! Greetings! 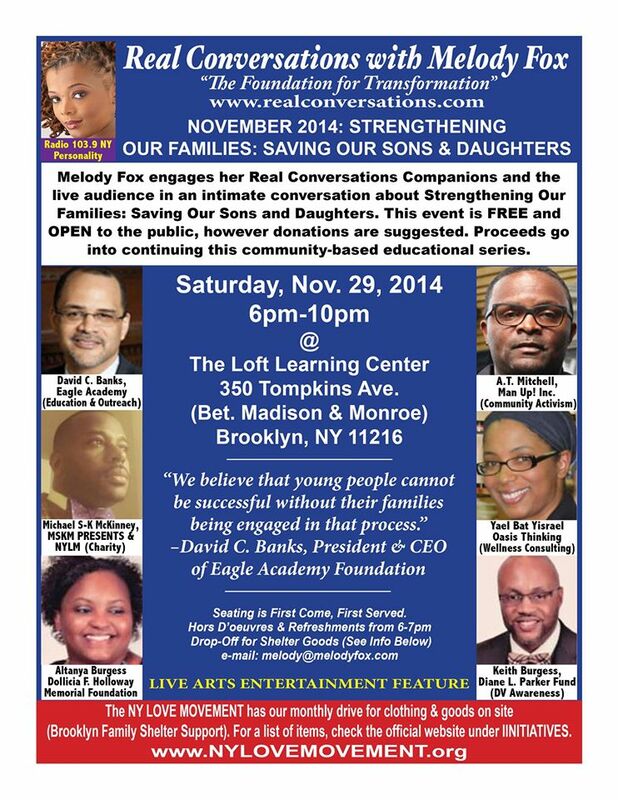 On November 29, 2014 in Brooklyn, I had the honor of being a guest panelist on the topic of “Strengthening Our Families: Saving Our Daughters and Sons”, the latest segment in the “Real Conversations with Melody Fox,” community discussion series. Please click on the thumbnail below to see an enlarged photo of the event flyer. Let me first thank Melody Fox of www.realconversations.com for inviting me to speak on such an important issue, with my focus being on family health and wellness. I also would like to publicly thank all of my family and friends who came out to the discussion, especially Rabbi Yeshurun, President Lorand Kenan, and Emah Ruth Green of Beth Shalom Ethiopian Hebrew Congregation of Brooklyn. As you all know, I am always ready to share my experience with natural healing remedies, as well as the importance of proper nutrition during pre-conception, pregnancy, and beyond. Not only did I have a chance to go deep into my own successes with breastfeeding and making homemade infant formula, but I also discussed how certain mineral deficiencies contribute to post-partum depression and fatigue. Stay tuned for new posts here at Oasis Thinking, and on our FB page at www.facebook.com/90daysraw, where I will go further into more detail about this crucial information. The lineup of panelists was stunning, from David C. Banks, Founder and CEO of Eagle Academy Foundation, to Pastor Keith Burgess and his wife Altanya Burgess of the Dollicia F. Holloway Foundation, to Michael S.K. Mckinney of MSKM Presents, to Community Board 5 President, Andre T. Mitchell, Founder of Man Up, Inc.! What made the night so fulfilling was the depth of sharing, led by our hostess Melody Fox, and fostered by the panelists and community members who took the microphone and elevated the discussion beyond cliches and surface solutions. You can see my post-event happiness right here: https://www.youtube.com/watch?v=GTykqrasnGY&feature=youtu.be.! I look forward to the next “Real Conversations with Melody Fox”, and continuing my commitment to share health and wellness education as Founder of Oasis Thinking. Stay tuned for upcoming Oasis Thinking workshops and/or speaking engagements! Thanks for the honor of having me on the Real Conversations panel! Your commitment to our healing and success is inspiring. Love you!